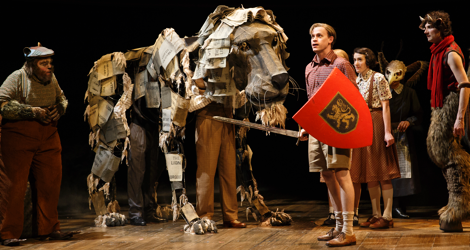 With The Lion, the Witch and the Wardrobe Stratford has produced the best family-friendly show since Peter Pan in 2010. Though there are many adaptations of C.S. Lewis’s children’s book from 1950, Stratford is using the one written by Adrian Mitchell (1932-2008) for the Royal Shakespeare Company in 1998 that became so successful it ran every holiday season in Stratford-upon-Avon from 1998 to 2002 and transferred to London. It is one of those rare adaptations of children’s literature that hits exactly the right note of humour and wonder that will please both children and adults alike. The design is wonderfully whimsical and the direction by Tim Carroll, who also directed Peter Pan, is stunningly inventive. Mitchell’s adaptation hews very closely to the original novel and even preserves much of the original dialogue, but he decides to start the action a bit earlier than Lewis does. The play opens in a railway station with air raid sirens wailing and the sounds of bombs exploding. This brings home the reason why the four Pevensie children – Peter, Susan, Edmund and Lucy – are being sent away from London to live with a Professor Kirk in the country to keep them safe during the German air raids. This also presents us with the vision of a world turned into a nightmare which is what Narnia during the reign of the White Witch will be. In Mitchell’s adaptation the bedroom for Susan and Lucy is lined with books and “on top of the bookcases are glass cases with various stuffed birds, fish and small mammals”. Tim Carroll, set designer Douglas Paraschuk and projection designer Brad Peterson have expanded on Mitchell’s description to inspire both the look and their interpretation of the novel. Not just the girls’ bedroom but the whole of Professor Kirk’s house is said to be full of books. Following that lead Paraschuk has made virtually everything not only in the Professor’s house but also in Narnia out of books. Stacks of them exist in both worlds. Books serves as chairs in both. And in a brilliant move costume designer Dana Osborne has made the fur and the mane of Aslan the Lion out of the pages of books. If you look closely you’ll see that many are books that the Pevensie children mention by title as existing in the Professor’s library. In Lewis’s novel Narnia is presented straightforwardly as another world. In The Magician’s Nephew (1955) we learn that the wardrobe gives access to Narnia because it was built of wood that originally came from Narnia. The design of Carroll’s production, however, suggests that Narnia may actually be a product of the children's’ imagination inspired by the books they have read. Besides that, Carroll does away with the cases of stuffed animals that Mitchell mentions and replaces them with a more potent image. In the girls’ bedroom is a special lamp with a revolving shade from which hang shapes of various animals. When the lamp is one we see these shapes roam across the walls of the room in Peterson projections. Lucy insists that she wants the lamp on all night. When the girls are asleep we see in one of Peterson’s most imaginative ideas how the silhouettes of the animals on the walls subtly change from familiar animals to mythic creatures like dragons, fauns, satyrs, and mermaids. Is this a magical lamp or have Lucy’s dreams changed the animals into those she will later find in Narnia? Once the children have been the kings and queen of Narnia for some time, Lewis states and Mitchell quotes hims that “If ever they remembered their life in this world [meaning Narnia] it was as one remembers a dream”. Both the direction and the design of the play emphasize the notion that Narnia is not a real and separate fantasy world, but is actually the world of dreams informed by the books the children have read. This idea is underscored by Carroll’s use of Professor Kirk servants as the people in Narnia who move properties for scene changes or who move trees about to suggest that other characters are walking. As Professor Kirk, Tom McCamus is given a wild head of hair and large beard that already make him look leonine and provide a foretaste of his role as Aslan in Narnia. On the Professor’s estate, Carroll periodically shows us a loving peasant couple played by Steve Ross and Barbara Fulton, who have the same habit of nose-rubbing when they play Mr. and Mrs. Beaver in Narnia. While Lewis intended the Narnia books specifically as a Christian allegory, Mitchell’s and Carroll’s approach broadens that interpretation. Parents who wish to see the story as a Christian allegory with Aslan as a Christ-figure, are free to do so. At the same time, parents who would rather not see the story as a Christian allegory are free to see the story as a dreamlike adventure tale of good versus evil. The fact that Narnia under the White Witch is a land of winter without any Christmas thus can be seen not as the way to describe an unhappy world but as the as the way four particular English children would describe it. The production is full of humorous touches that are definitely not in Lewis. After Aslan appears he strikes a pose in front of the assembled animals that momentarily recalls King Mufasa before the multitudes in The Lion King. When the Beavers are handed fur coats when they must flee their home, Steve Ross’s Mr. Beaver stops and smells the coat he’s given and then hugs and fondles it as if the pelts were from beavers he used to know. One sequence from Lewis that appears in Mitchell's version and is especially funny in Stratford is when the four children have grown into adults and as royalty suddenly express themselves in pseudo-Shakespearean language. The actors stiff attitudes, stock gestures and orotund voices immediately recall the kind of Shakespearean acting one has seen on occasion in the Festival Theatre. This is the kind of production where direction and design trump acting, but still the entire cast is unanimous in striking exacting the right tone of Mitchell’s adaptation midway between reverence and parody. As adults playing children the four actors all speak their lines with the same enthusiastic tones and express disappointment with the same lowered voices and slower speech. They each bring out at least one salient trait in their characters. Gareth Potter’s Peter is the most inquisitive, Ruby Joy’s Susan the most sensible, André Morin’s Edmund the least trustworthy and Sara Farb’s Lucy the kindest and most awe-struck. Tom McCamus clearly distinguishes his two roles as Professor Kirk and Aslan. He plays the Professor with an Irish accent and an air of absent-mindedness and whimsy. To Aslan, McCamus lends his fullest, richest voice and manipulates the head of the Aslan puppet with skill. Yanna McIntosh plays Jadis, the White Witch, very much like an evil pantomime queen. I’m sure if she had encouraged it her every appearance would set off an enthusiastic round of boos from the children. Her White Witch is so vain and self-centred that it is comically easy to see through her attempt to appear kind to Edmund. She has an evil laugh as good as any Disney witch, but when the situation turns serious as in Act 2, McIntosh can summon up a cold authority that proves that she is a real threat to all of Narnia. more intricate and more nerve-wracking than any of the battles in Macbeth, even though John Stead is the fight director for both plays. 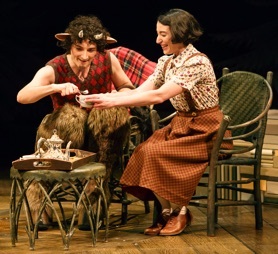 Among the good creatures of Narnia is Mr. Tumnus, the Faun, played with good humour and sensitivity by Mike Nadajewski. He makes Tumnus’s confession to Lucy of his evil intent simultaneously comic and moving. Nadajewski also has the chance to show off his fine voice in some of the folk-inflected songs Shaun Davey wrote for the 1998 production. Also delightful are Steve Ross and Barbara Fulton as the lovey-dovey Mr. and Mrs. Beaver, who make speak in countrified accents but who exude kindness and common sense. The show is so filled with magical effects that are achieved purely by theatrical means, that it is a pity Carroll had to use the six vertically sliding video screens at all. They were fine when they simply represented changes of scenery, but Carroll also used them for animated effects that ought to have been conceived theatrically. The prime example occurs when the Giant Rumblebuffin (a gruff Sean Arbuckle) breaks open the gates of the White Witch’s castle and the effect is seen only on the screen but not on the stage. Overall, The Lion, the Witch and the Wardrobe is an utterly charming and thoroughly entertaining show with enough action, adventure and wonder to appeal to children and enough humour and gentle self-parody to appeal to adults. Both won’t fail to be awed and delighted by Dana Osborne’s hugely inventive costumes. The ending of Mitchell’s adaption, which I will not reveal, deviates from Lewis’s own but its joyous celebration of the real and the fantastical sums up mood of the entire play. 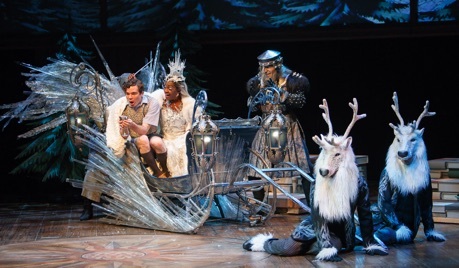 Photo: (from top) Steve Ross as Mr. Beaver, Colin Simmons and Tom McCamus as Aslan, Gareth Potter as Peter, Sara Farb as Lucy, Alexis Gordon as Eagle and Mike Nadajewski as Mr. Tumnus; Sara Farb as Lucy; André Morin as Edmund, Yanna McIntosh as the White Witch, Josue Laboucane as Troll and ensemble; Mike Nadajewski as Mr. Tumnus and Sara Farb as Lucy. ©2016 David Hou.